SAP has its foundation in 1972, SAP AG, based in Walldorf, Germany has become Europe’s largest software developer. In the field of ERP software, SAP is the world’s market leader. SAP training helps one to gain expertise in software and programs that run them along with SAP modules. SAP builds a strong technical support for organization. 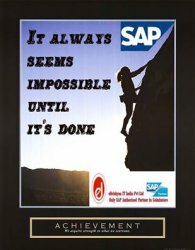 We are the proud and privileged only SAP authorized academy in Coimbatore imparting courses since 2009. 100% Placement Support will be provided after training and certification in SAP.